Serving as a prelude to what’s coming next in the summer music series I’ve going, let’s examine one of the truly forgotten songs of the ’70s. A strangely familiar number that would be described as a one-hit wonder. Looking back, the term also displayed a hard truth of the U.S. music market. A bias. Denoting ‘one-hit’ here, also carried a built-in disregard to any success overseas the artist may have had, before or after, by us. The Spanish singer and songwriter enjoyed popularity before the ’70s arrived, and a self-produced Polygram album in 1977 generated world-wide recognition well into the ’80s. Of course, such global acceptance conveyed the other side of what I’ve mentioned. Generally, an American indifference to popular music from overseas not initially created over here. Still, when a song had mass appeal, it gathered everyone’s ears. A sub-genre of rock music that developed during the late ’60s, which brought the accompaniment of a symphony orchestra with it. It’s what marked a number of bands in the era. To include The Beatles, The Moody Blues, Emerson, Lake, and Palmer, and others, and prospering into the next decade. Many of us then were primed by the Spring of 1970 for what this single carried in. Released by A&M Records, #1193 if you’re interested in vinyl catalog numbers, it’d peak at #14 on Billboard’s Hot 100 chart. If the tune sounds familiar to you, it should for anyone even remotely acquainted with classical music, or seen Die Hard. A Song Of Joy was based on the last movement of Ludwig van Beethoven’s famed Ninth Symphony, recognized by most as Ode to Joy. 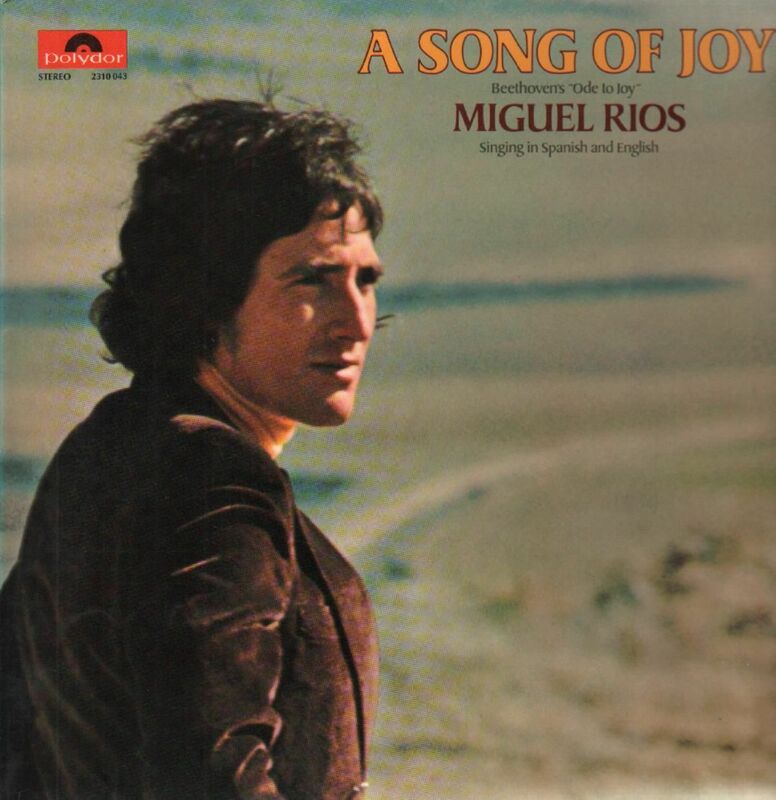 It’d get Miguel Ríos the most airplay on American and European radio he’d ever experience. 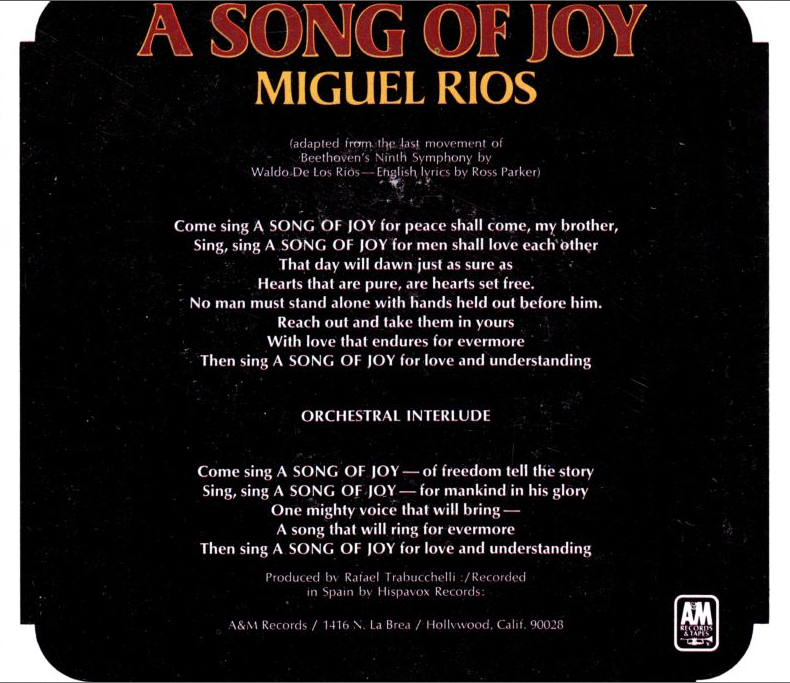 As it happened, Ríos would initially record his wide-ranging hit in his native Spanish for Polygram, titled “Himno de la alegría” (Hymn of Joy), before the A&M label would latch on to its translated version1. In fact, both renderings would use the exact same arrangement, right down to its celebrated orchestration of the ninth’s final segment. Beyond Beethoven’s most famous and climatic movement, the appeal surely was Señor Ríos remarkable vocal of the work. He does have a fine voice, especially when you compare the Spanish against the English translations — using songwriters Waldo De Los Rios and Ross Parker (who did the English) lyrics. His Granadian Spanish-accented English provided this rendition a surprising lyrical lilt to the sung anthem, and American radio-listener ears. I’m telling you, only a unique time such as this could have given rise to a sui generis pop number like it. The work, a first for a major composer using voices in a symphony, by a German symphonist and pianist from the 18th century suddenly wresting the pop market away from contemporary artists in Tom Wolfe’s “Me Decade.” Reusing his famed ode, normally sung by a German chorus, the jubilant piece celebrated the brotherhood and unity of all mankind. Who knew? We didn’t, that’s for sure. Defiantly translated to English, and sung with phonetic gusto by a Spaniard in what would be his only American hit2. Yet, it’s all those seemingly incongruous facets, along with its triumphal tone, that was the old/new song’s strength. A nonchalant attraction for those of us unknowingly headed into the most turbulent decade we never saw coming. What can I say? It was the ’70s, and this our ironic theme song.